Virtual Image Stitcher (VIS) is one of the very few products available commercially that creates an image of an entire sample placed on the stage of a scanning or optical microscope using a very high magnification to capture sub-images. 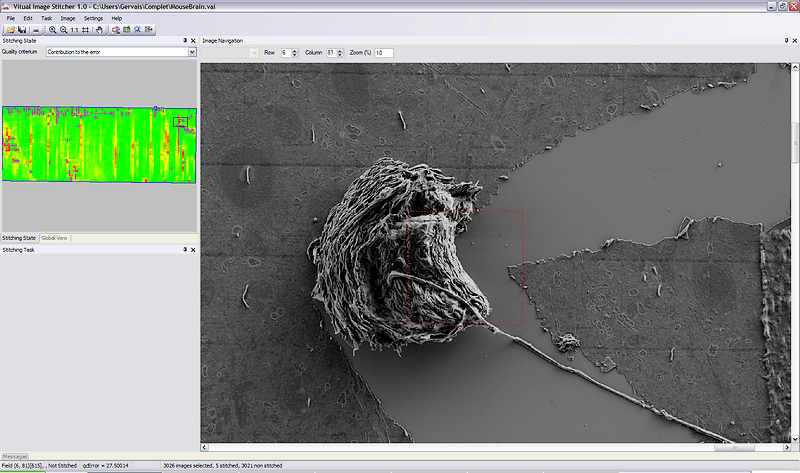 VIS is a stand-alone application capable of generating an image up to more than hundred Gigabytes1 from a series of overlapping sub-images captured at high magnification in a rectangular grid pattern. VIS can be used in an automatic, semi-automatic, or manual mode, depending on the pixel data in the overlapped areas. VIS is an optional extension of the Aphelion™ Imaging Software Suite that is compatible with Aphelion Dev. With Aphelion Dev 64-bit version, a stitched image can be processed at either the resolution used for the original image capture (provided the stitched image is divided into a set of large regions of interest), or in a range of lower resolutions as one single image. Virtual Image Stitcher has been designed to stitch any set of images captured as a rectangular grid of overlapping sub-images, such as is produced by the Aphelion Virtual Image Capture (VIC) optional module. VIC and VIS both use the Virtual Aphelion Image format. This format includes the scanned set of sub-images and the microscope’s parameters (e.g. stage repeatability, resolution, estimated horizontal and vertical overlaps). A set of images captured by a third party system can also be imported into VIS using its import feature. This feature makes the VIS software compatible with most microscopes and similar systems (e.g., optical or electronic microscope with an automatic stage, copy stand) available on the market. VIS includes a set of wizards to aid the user in quickly generating a stitched image. First, a transformation may be applied to a single or a group of sub-images to compensate for geometric distortions and illumination problems. Second, the stitching process is applied to the entire set of sub-images or to a user-selected subset. Stitching quality results are displayed in a window (see adjacent) to help the user identify correlation problems. Parameters can be adjusted to enhance the stitching process. The automatic stitching process will sometimes fail for some sub-images due to the lack of information or the repetition of similar patterns in the overlapped areas. In such cases, the user can manually or semi-automatically stitch the problematic sub-images to complete the process. Next, a registration transformation can be applied to align the stitched image with the reference image. This is particularly helpful when the two images were scanned: at two different magnifications; by two different sensors; or after a mechanical or chemical process was applied. This registration transformation is applied to the entire stitched image. Finally, the generated image can be exported as one single image or as a Tiled Tiff image. VIS includes a powerful viewer enabling the user to navigate inside a virtual image at any magnification. The display of images at lower intermediate resolutions dramatically enhances the on-screen refresh of the virtual image. The VIS Export wizard aids the user in generating an image that is saved on disk for further processing and analysis. Export parameters such as the area of the region to export, the zoom factor, and the image format (tiled image or single image) are user defined. An exported virtual image at a low resolution can be easily inserted into a report. Note that Virtual Image Stitcher is compatible with up-to-date configurations of Windows® 7, 8, 8.1, and 10 operating systems, for both 32-bit and 64-bit versions. However, the benefits of VIS are best achieved on 64-bit systems. 1 Virtually no limit – Image size is limited by hardware configuration. VIS has been successfully used to stitch a set of 7,500 images, each image of size 7 mega pixels. N'hésitez pas à nous contacter si vous souhaitez de plus amples informations sur Aphelion Virtual Image Stitcher. Plaquette Aphelion Virtual Image Stitcher disponible en téléchargement en bas de page.